Western blot analysis of extracts from various cell lines using LDB1 Antibody. Immunoprecipitation of LDB1 from K-562 cell extracts. Lane 1 is 10% input, lane 2 is Rabbit (DA1E) mAb IgG XP® Isotype Control #3900, and lane 3 is LDB1 Antibody. 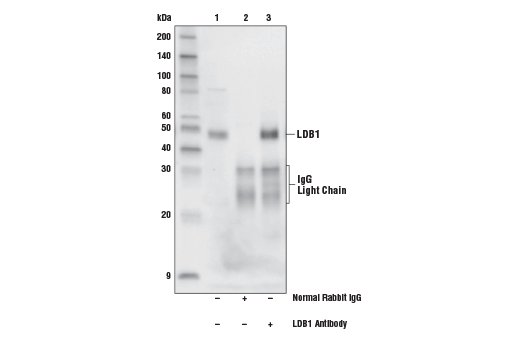 Western blot analysis was performed using LDB1 Antibody and Mouse Anti-rabbit IgG (Light-Chain Specific) (D4W3E) mAb (HRP Conjugate) #93702 secondary antibody. 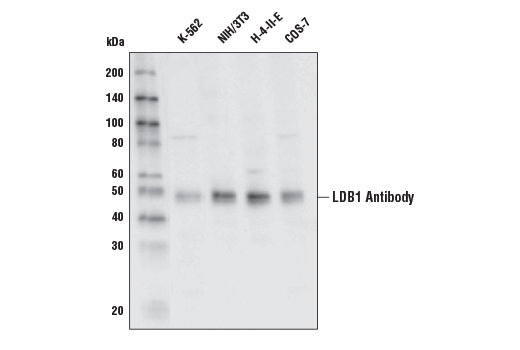 LDB1 Antibody recognizes endogenous levels of total LDB1 protein. Polyclonal antibodies are produced by immunizing animals with a synthetic peptide corresponding to residues near the carboxy terminus of human LDB1 protein. Antibodies are purified by protein A and peptide affinity chromatography. LIM-domain binding protein 1 (LDB1) is a nuclear adapter protein and transcription co-factor that interacts with a multitude of LIM-domain containing transcription factors. Through such interactions, LDB1 facilitates promoter-enhancer bridging and is necessary for the activation and/or repression of genes in multiple cell lineages, including neuronal, cardiac, and hematopoietic cell lineages. Specifically, LDB1 associates with the T cell acute lymphocytic leukemia protein 1 (TAL1) and the nuclear adaptor LIM domain only 2 (LMO2) protein to regulate erythroid gene expression (1). LDB1 is crucial for hematopoietic development, and deletion of LDB1 results in embryonic lethality (2). LDB1 is also required for the maintenance of basal mammary epithelial stem cells and promotes breast tumorigenesis (3). In addition, LDB1 stabilizes LMO2 and is necessary to promote oncogenic properties of LMO2-driven leukemia (4). Structurally, LDB1 contains an amino-terminal homodimerization domain and a carboxy-terminal LIM interaction domain (LID). This protein has no known enzymatic or nucleic-acid binding functions (5). Love, P.E. et al. (2014) Trends Genet 30, 1-9. Mukhopadhyay, M. et al. (2003) Development 130, 495-505. Salmans, M.L. et al. (2014) PLoS Genet 10, e1004520. Layer, J.H. et al. (2016) Mol Cell Biol 36, 488-506. Matthews, J.M. and Visvader, J.E. (2003) EMBO Rep 4, 1132-7.